Band in a Box is intelligent automatic accompaniment software for your computer. Thanks to this software you can practice guitar with a virtual band, making your practice routines more effective and fun. Band in a Box automatically generates a complete arrangement for any chord progression, with piano, bass, drums, guitar, and strings or horns. You can input any song you want in Band in a Box. You can even download a file that contains all songs of the Real Book. Practicing with Band in a Box does wonders to your timing, say goodbye to your metronome. 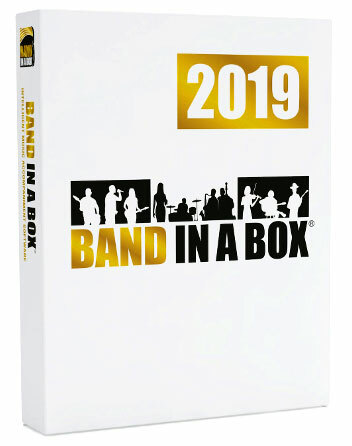 Band in a Box provides you a realistic context in which your music is intended to be performed. Practicing scales and arpeggios becomes fun again... By having a harmonic background, otherwise boring exercises sound like real music. Band in a Box is ideal for speed training. By gradually increasing the tempo of your exercises step by step you can increase your speed in a systematic way. You can practice improvising over chord progressions and jazz standards in a realistic way. You can experiment with chord substitutions in a realistic way because you can actually hear what is going on. You can work out chord voicings by eliminating the piano. You take over the accompaniment while Band in a Box plays bass, drums and melody. You can practice sight reading (from the on-screen traditional notation, as well as guitar tabs). You can record and listen to yourself playing along with the accompaniment (you'd be surprised, it's like looking in the mirror). You will get new ideas by using the soloist or melodist. You will be better prepared for jams or rehearsals. Band in a Box is a tremendous motivation boost! 100+ Soloists: select the soloist button, choose an artist (Pat Metheny, George Benson, Parker, Django Reinhardt, ...) and Band in a Box automatically generates a solo in the style of your chosen artist over your chord progressions. 60+ Melodists: same concept as the soloist, but for melodies. Virtual Guitar Track: you can see every note that's played on a virtual guitar neck. Guitar Tabs: besides traditional notation and Real Book style chord input, there are guitar tabs as well. Real Drums: the drum track is made of full recordings of real drums, no computer-sounding Midi drums. The recordings were done by professional jazz drummers. Reharmonist: generates a chord progression based on your melody, in the style you choose. Chords from mp3: load in any mp3 or wav and Band in a Box finds out the chords for you. Astonishing! Recording: record your guitar improvisations and replay them with accompaniment. Burn & export: put your recordings or accompaniments on CD or export them to mp3 to post online. The good news is that you can get all this for the price of about 8 play-along cds. Band in a Box is easy to install and operate. Technical support from the publisher is excellent, help is available in the evenings and on weekends - definitely an added bonus for busy musicians. With the help of Band in a Box you can improve your guitar playing in an fun and effective way. Mmmm sounds like not only a great practice tool but also a good recording tool for originals.. I will be getting this in the near future! Can i do tempo maps , slowing endings, faster choruses etc.? Impressive capability and live sounds! Any idea how much hard drive space is required to install? Hi Rick, you need 1GB free disk space for a minimal install, but 15GB+ is recommended. Great jazz backup sounds. Been using it live on laptop for restaurant guitar gigs for years. Is this a downloadable program like Transcribe or do we receive hardcopies on CD or other media? If downloadable, can we use it on multiple PCs, e.g. office desktop and practice room laptop? Hi Griz, yes, it's a downloadable program and you can use it on multiple devices. Hi, what a impressive program! it is possible to print a realbook like score sheet? and the most important to me, there is some samba jazz soloist realtrack available with some example on line? Hi Hector, yes, you can print out Realbook-like lead sheets. There are several Latin-style Realtracks included, such as samba and bossa. Is there an Ipad version ? Is there a German Version? Hi Kurt, yes there is a German version of BIAB. Yes there are no grids, it's chord symbols so all good. Sounds from instruments are included in the price or I have to buy them separately. Hi Zeljko, yes 200+ Realtracks are included. Can I use just the drum or bass track? Sure, Ake, you can mute any instrument you like. Painful to know that machines do far better than me, even form a creativity point of view. Also a bit like the race between "The Hare and the Hedgehog". Can I make a backing track and export it in WAV format to my Boss Loop Station?